This extraordinary vintage pen is a 1901 Waterman 12 eyedropper-fill Chatelaine ring-top in Black Hard Rubber. Very rare, early and short lived model with a long barrel, designed to be comfortable to hold while the cap is still hanging from the watch chain or chatelaine. Also with the very rare extremely thin barrel threads and extra-long gripping section. GFT, including the wide repousse barrel and cap-top bands. The cap-top band engraved “Dr. Arnold.” Can’t you picture him in his white coat and vest with the chain attached to a button with a watch in one vest pocket and this pen in the other! Fine, extra-flexible nib. Near mint. Item #20 in Catalog #84. 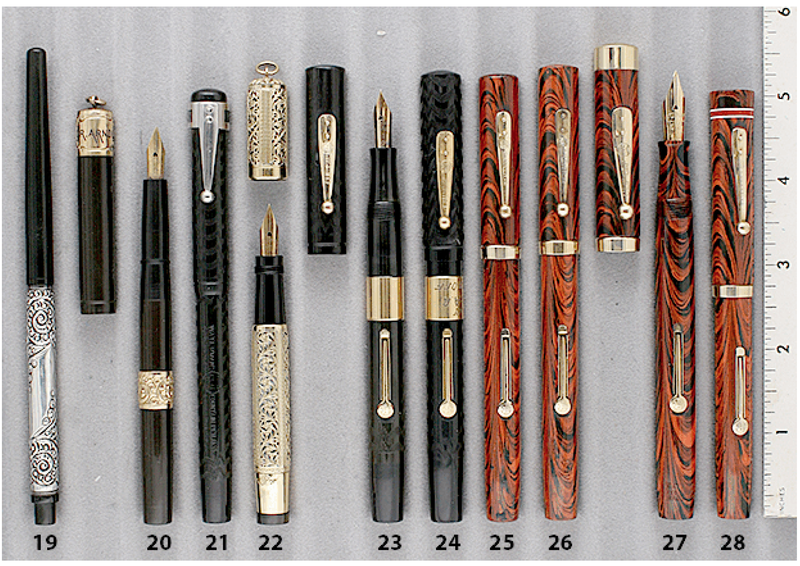 Subscribe to our Quarterly Catalogs to be amongst the first to see the vintage pens! This entry was posted in Vintage Pen, Vintage Pens and tagged Catalog, Catalogs, Extraordinary Pens, Fountain Pens, Go Pens, GoPens, Vintage Fountain Pen, Vintage Fountain Pens, Vintage Pen, Vintage Pens, Waterman. Bookmark the permalink. Follow any comments here with the RSS feed for this post. Post a comment or leave a trackback: Trackback URL.